While my daughter is busy learning about mechanical engineering at college, I recently decided to take a class about mushrooms. (Yes, life is hard!) Why mushrooms? Of course, mushrooms taste wonderful and are part of the culinary heritage of most Asian and European cuisines, but more importantly, they have incredible medicinal benefits. Mushrooms are one of the only plants food in the world that have naturally occurring Vitamin D. For many women, who have a tendency towards osteopenia and osteoporosis as they age, getting more Vitamin D is essential. In addition, mushrooms have adaptogenic qualities. Adaptogens, which are naturally occurring substances in plants, have become popular of late on mainstream health blogs, even though Chinese medicine and Aryuvedic practitioners have been talking about them forever. Adaptogens help regulate the body’s stress response. They react to whatever is stressing your body at that particular time. In order to pull out their medicinal properties, mushrooms have to be heated. Whether you cook with button, cremini, oyster, shiitake or any mushroom variety, it’s important to use organic mushrooms to ensure you get their medicinal effects. Try them in a soup or stew, or sauté them and put them in an omelet or on polenta. In the class I took, we focused mostly on reishi mushrooms. 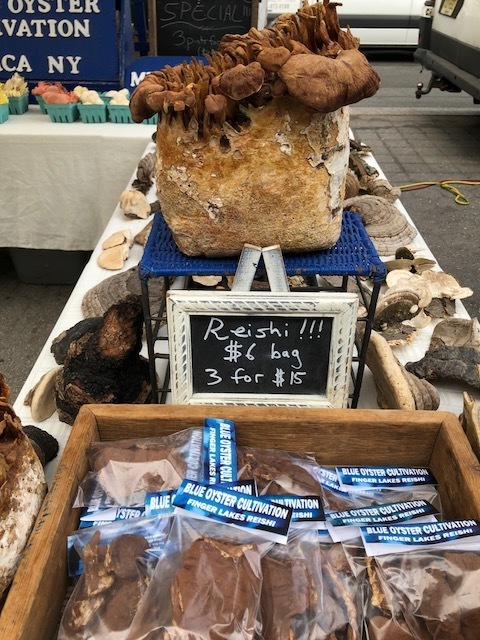 Reishi mushrooms are also known as the mushroom of immortality. Studies show that they can strengthen immune responses in humans, lower blood pressure and reduce inflammation and moderate stress. They’re also good for your kidneys. According to the herbalist who taught the class, you use mushrooms to avoid illness, not to get better. In other words, they might help prevent you from getting a cold, but won’t cure it once you have it. The easiest way to use reishi mushrooms, is to make your own delicious mushroom tonics and teas. When using actual reishi mushrooms to make your tea, fill a large pot (a dutch oven will do) with filtered water. Bring it to a boil, as soon as its boiled, put in the reishi mushrooms and let it simmer for three hours. (If you have an instant pot, cook it for an hour.) After cooking, wring out the mushrooms into the water. You can reuse the mushrooms. You’ll know it’s time for a new mushroom, when the water turns clear. Store the mushroom in the refrigerator in a plastic bag with a little water. (I tried this but left it in there for too long and it started to get moldy so use it within a week or two.) I went to Blue Oyster Cult at my local farmers’ market and they told me it was okay to store the mushrooms in the freezer. So what does mushroom tonic taste like? It’s definitely bitter. I added some salt to it and was very happy with the taste. (I had a little truffle salt sitting around and well, that made it divine). Others like to counter the bitterness with a bit of honey. 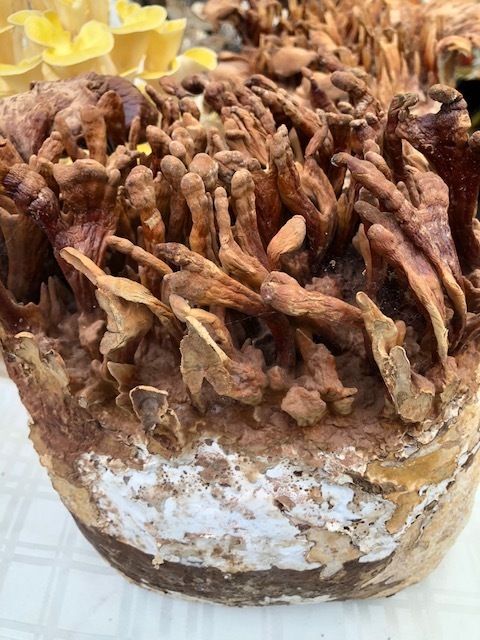 If you don’t have access to reishi mushrooms, look for a dried source online. You can also use tinctures or dried mushroom powder.